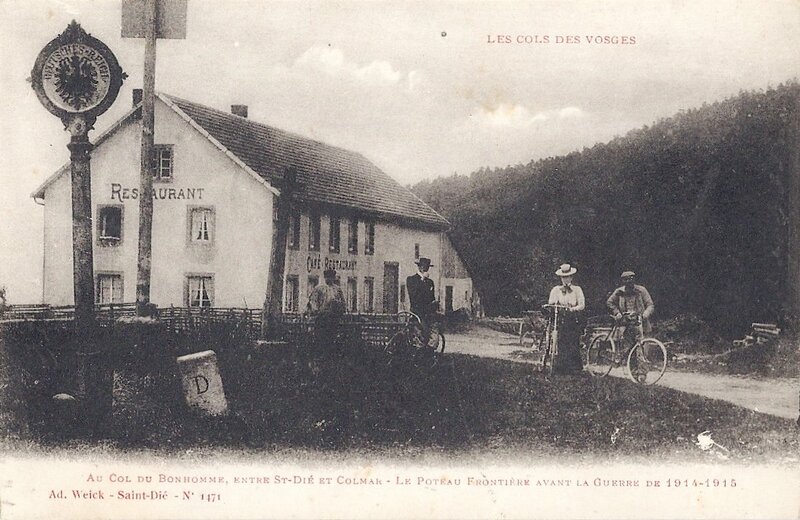 The Col du Bonhomme has been a route through the Vosges for centuries. 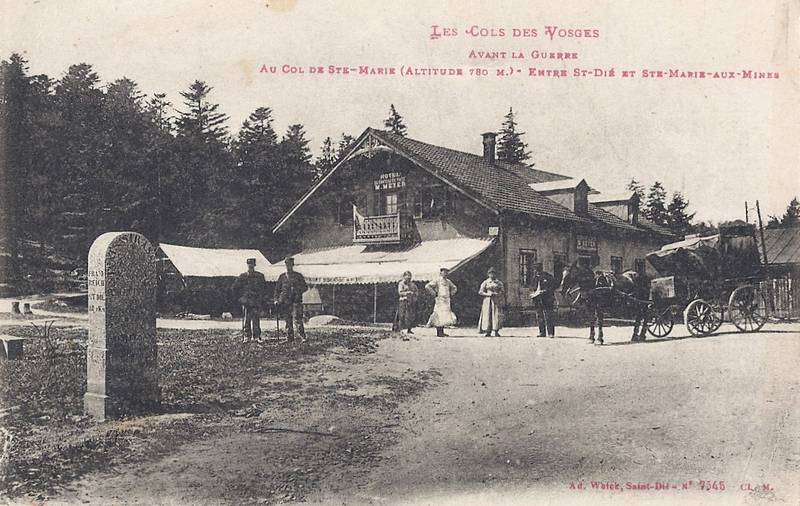 It’s at the point where the main road from Nancy and St-Dié to Colmar crosses the Route des Crêtes, which was established in the Great War as a route along the ridge of the Vosges for the easier movement of French troops. It used to look like the card below posted in 1913 shows. As a border crossing between annexed Alsace and the rest of France, it was patrolled by customs officials and the frontier was marked with a metal plaque on a striped post: a poteau frontière. 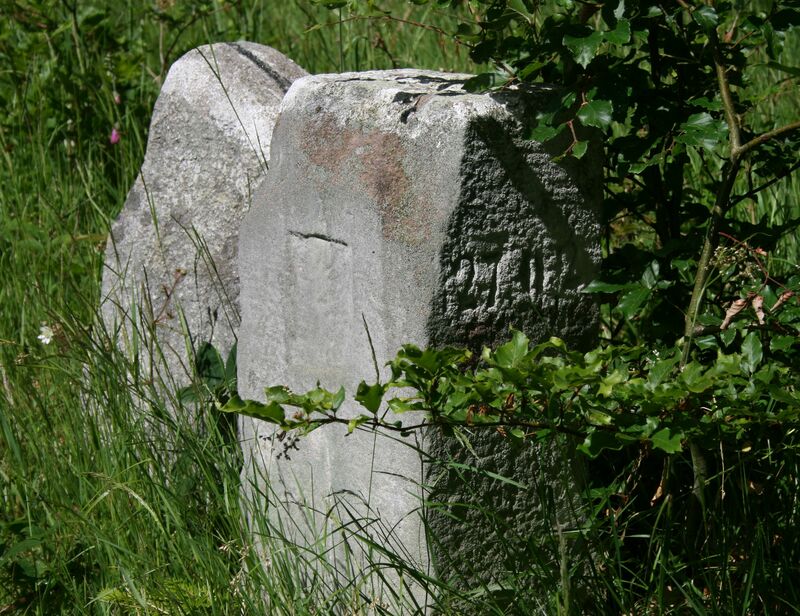 On closer examination, it’s clear that these are the original bornes frontières (frontier stones). The smaller, more rugged one was a rudimentary interim measure while the occupying forces of the German Empire had marked stones made. I think these date from the mid-1890s. The bornes were numbered and on this one it’s possible – just – to distinguish the number 207*. 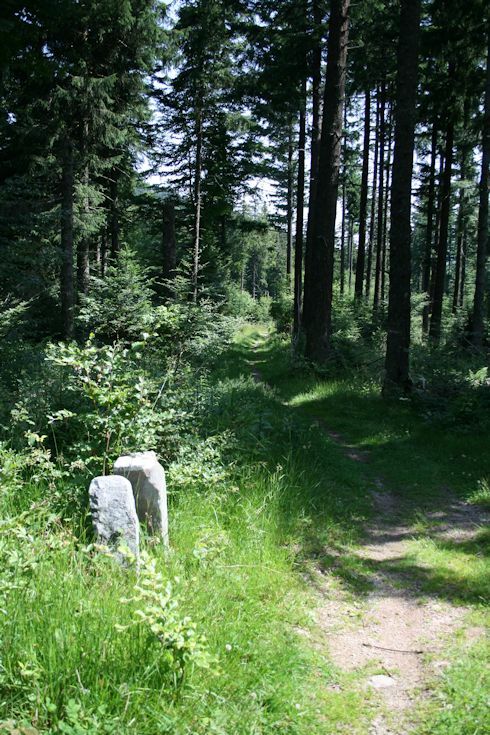 Bornes marked the frontier at crossing points, at cols, across meadows and across high pastures (chaumes), from the border with Luxembourg to the border with Switzerland. From Luxembourg to Donon they were the responsibility of the German authorities and France was responsible for the rest. Originally the stones were not very visible and thus easily damaged by passing vehicles, or by disgruntled locals, so the bornes considered most at risk from traffic damage were painted white. The original bornes were supposed to be just over a metre tall at the front with a face about 30cm across, with a base sunk into the ground to about 60 cm. They were lettered D (Deutschland) and F (France) and they carried their identification number. (It is often possible to distinguish the letters on the bornes which remain.) Given the length of the new frontier, the necessity of marking it quickly and the difficulties imposed by the mountainous terrain, some were less well executed than others. This borne is at the Col de Ste-Marie. “So many regrets in these few words! Our Alsace. So close to us yet no longer of us! 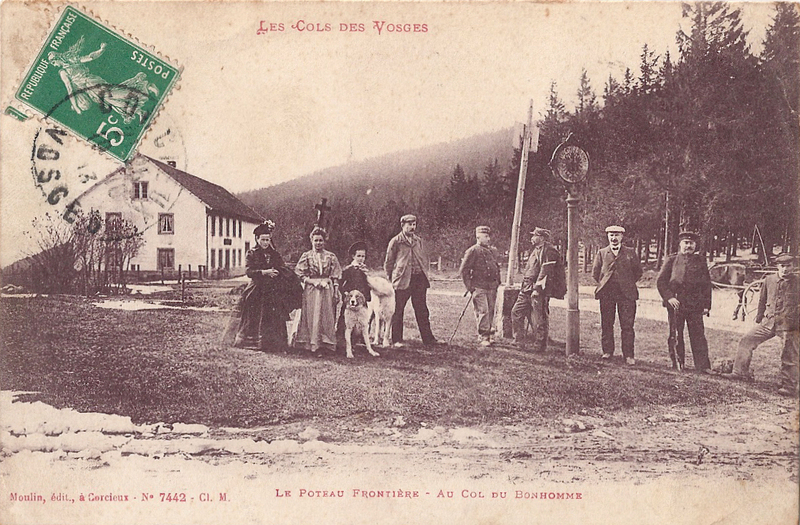 Categories: A little history - the background and the early frontier, Administering the frontier before the Great War, The Vosges Cols | Tags: Alsace, bornes frontières, Col de Ste-Marie, Col du Bonhomme, Elsass Lothringen, Vosges | Permalink. Hello. Highly appreciated your report – with interesting details on postcards. 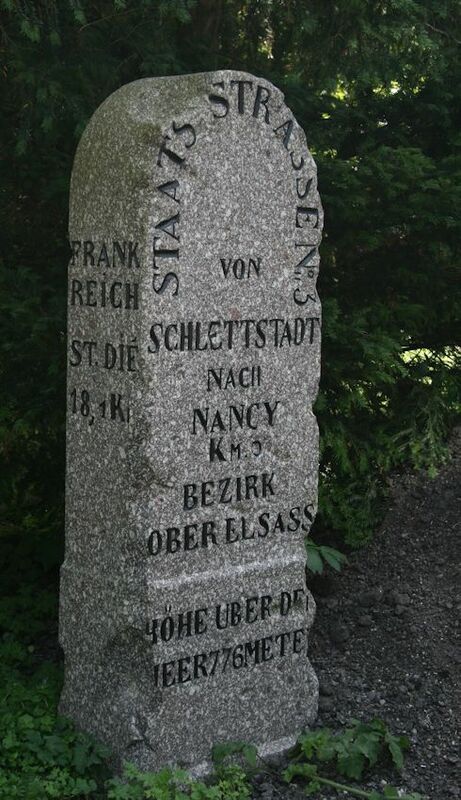 Just put online a report about the border stones of the 1871 border between Luxemburg and Switzerland on my HP under “Grenze F-D 1871”. Would appreciate your contact. Regards. Oswald.